Square Note puts a huge library of Gregorian Chant scores—over 600 unique chants and counting—right at your fingertips. Always wanted to learn how to read square note notation? Always wondered how to find all the amazing Gregorian Chants of the Catholic Church? 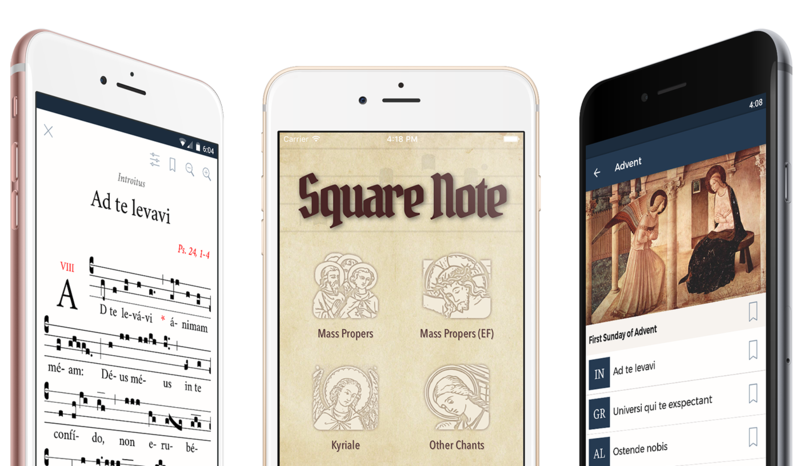 Square Note brings the ancient music of the Church to your mobile devices, ready for you to utilize in your schola, your choir, or your home. Want to suggest an improvement or recommend more chants? Found a mistake in a chant? Need to report a bug? Drop us a line at feedback@squarenote.co. We appreciate your input to make Square Note the best it can be. Also, please leave a review on the Apple App Store and/or the Google Play Store if you like Square Note. Thank you! Square Note renders all of the chant on the fly and instantaneously, meaning that you can zoom in and scroll easily and quickly. If you are using a phone, the chant will adapt to optimally fit the smaller screen; if you are using an iPad or an Android tablet, the chant will be luxuriously presented to better utilize the generous screen real estate. Enjoy pixel-perfect ancient chants right in the palm of your hand. Square Note not only allows you to view chant, but to interactively play the notes back as well. If you thought singing square note notation is too difficult, Square Note will quickly dispel that notion. Learn how to chant ancient Gregorian melodies in minutes with the visual note highlights as the chant melody is played back to you. The adjustable speed and pitch controls will make it a snap to fit your range and ability. Square Note was designed from the ground up to be elegant in its simplicity and flawless in user experience. Quickly and easily find the chants you're looking for by liturgical season, by collection, or even by full text search. Bookmark chants you need instant access to and Square Note will keep them at your fingertips, and enjoy the thematic artwork that accompanies the various categories of chant. Square Note includes over 600 unique chants, cataloged for both the Ordinary and Extraordinary Forms of the Mass. From Introit to Communion antiphons, from hymns to Marian antiphons, Square Note includes chants for use throughout the liturgical year, as well as devotional chants that everybody should know.